October 21st in Wordpress Plugins by Wordpress Jedi . 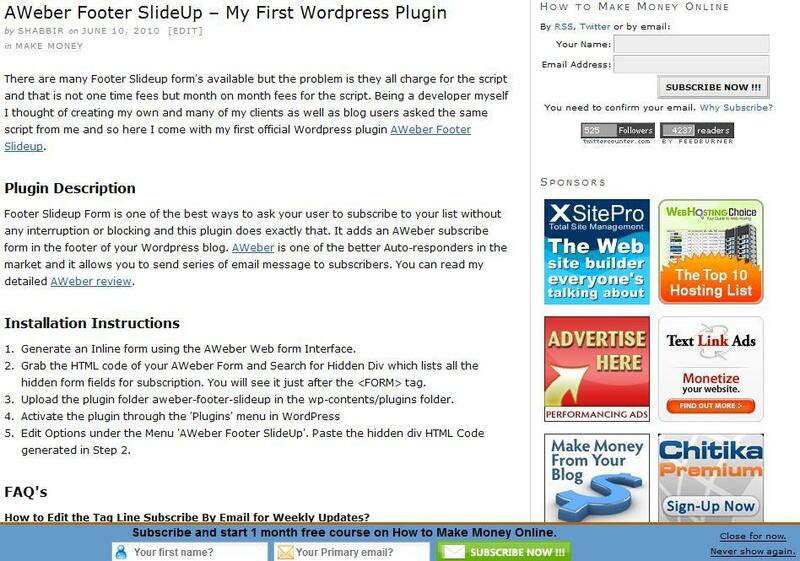 AWeber Footer Slideup: it helps you promote your newsletter without disturbing your readers. This plugin adds an AWeber subscribe form in the footer of your WordPress blog. The developer has plugins available for Feedburner and GetResponse also. WP leFooter: adds a customizable slide-up section to the bottom of your site. You get 5 predefined themes and custom color options. This is a premium plugin. Fancy Widget Popup: this cool plugin lets you add any widget to your sidebar and have it pop up when users reach the footer section. Use it to promote your social profiles or anything else you can think of. You can also use Facebook plugins, Foobar, and other similar tools to promote your social media profiles, newsletter, and limited-time deals. You simply have many choices here.